Difficulty adopting Unified Interface early in Dynamics 365? Is your goal being right or getting to the right solution? People go to lengths to avoid being wrong but tomorrow will it matter whose was right or who came up with the idea? Being wrong is the path to success with a detour. We seek out when we are wrong, understand why and move on. Our ego demands we right, our feelings hate being wrong but the quickest way to improve is by failing and feedback from others. Admitting you are wrong is short-term pain for long-term gain. People spend time to avoid being wrong but it’s quicker to try, be wrong and move on. The time wasted on avoiding being wrong could be used on working on trying new ideas. Being wrong is painful, you feel stupid, frustrated but this is your reaction to the event, when you reflect later its positive, you learned a lesson and corrected your path. It’s difficult to admit being wrong because it‘s initially painful to admit being wrong publicly. The goal is to do it right, how you get there isn‘t important tomorrow, so try to keep your perspective long-term. You learn by doing and often learn more by doing it wrong because you stop to understand your mistake so you can avoid it in the future. Is it important to be wise? do you want to be right or do you want the right answer? If being right means you personally are wrong, would you take it? 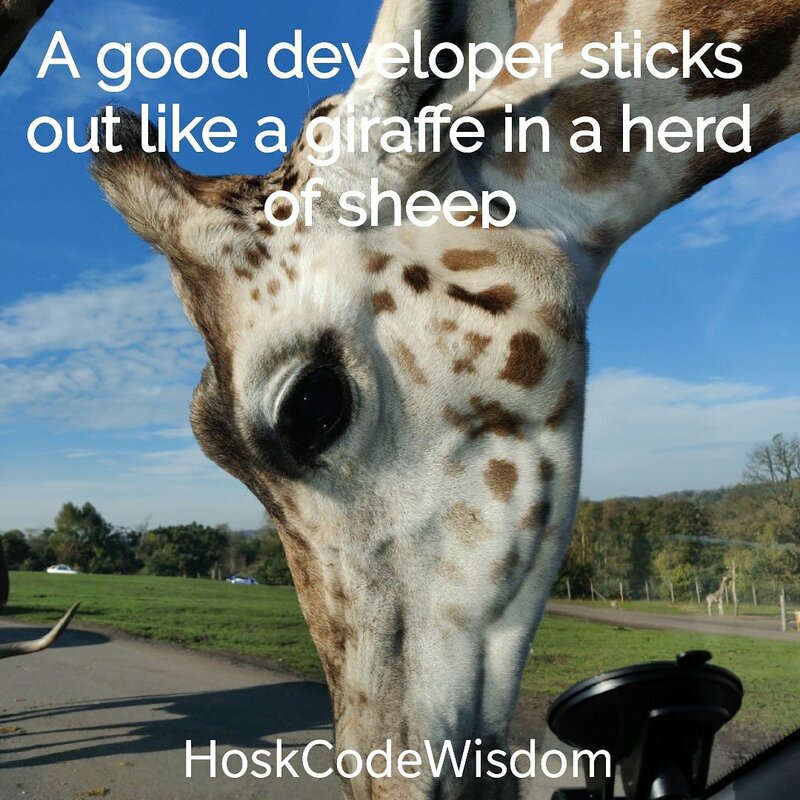 Code reviews are great for learning, an experienced developer checks your code, highlights bad code and suggest improvements. Despite the benefits it feels like the reviewer is critising your code but attacking you as person. This is an emotional reaction to being wrong and being critised, we have to overcome this with logic and understand this feedback is a great way to improve quickly. It leads to a higher quality code base and developers write better code, helping individual’s long-term prospects. It’s beneficial but not easy but it gets easier with practice. Reactions are emotional, they happen quickly and bypass thinking, the reaction is to defend your code. You respond by attacking, they defend and then they react and attack. The topic of the discussion is lost in the emotional responses, defending and attacking the ego. Time on your ego and being right, short-term gains drive this behaviour. The long-term logical view is to focus on learning, getting feedback and getting to the right solution. Winning arguments come at the cost of learning , you learn when listening. Winning an argument means you end the discussion with the same view as you entered, talked more than you listened and learnt nothing. There is no winning when arguing. Your goal as a software engineer is continuous improvement, being wrong, making mistakes and honest feedback are good teachers. We learn more from being wrong because we stop to analyse, when we are right we assume we have done it right once and we will do it right again. Long lasting change comes from knowledge and the ability to use that knowledge effectively and to write better solutions. Static Code analyzers help highlight code which breaks best practice. This is frustrating initially when lots of your code triggers error but learning the logic behind the rules helps grow your knowledge. When you copy and paste code you bypass the learning and don‘t acquire knowledge. Its like getting the answers to a test, you pass that test but you don‘t have the knowledge to pass other tests on the same subject. Understanding allows you to alter solutions and adapt your knowledge to solve to different problems. If you have copied the answer from the internet this brittle solution will break as soon as problem changes. You can’t adapt solutions which you don’t understand. Embrace being wrong, it’s a step on the path to understanding and developing a deeper knowledge of your area of expertise. Our fear of being wrong is exaggerated, people respect someone for admitting and fixing their mistakes. Mistakes occur when pushing yourself and doing things you don‘t have experience in. Getting out of your comfort zone, working through mistakes is how to improve at a fast rate. Playing safe and avoiding errors results in not learning and highlights you are playing too safe. The focus should not be on being right but creating the right solution. If you can avoid fearing being wrong, you will try harder things and push yourself to do more. Admitting mistakes and avoid wasting time arguing or avoiding being wrong allows you to do more. Building your tolerance for mistakes is the path for faster growth and improvement. Ignite has a wealth of resources for Dynamics professional. The problem is not having enough videos to watch, the problem is there is too many and finding the ones interesting to Dynamics professionals. I have picked out some of the presentations that look interesting. I haven’t watched them all but I have watched a bunch of them. This has been really useful to see how the changes, new features and new services (PowerApps, Common data service, Logic Apps, Flows) fit into future projects. Change will make or break your project, changes can‘t be controlled your reaction can. A fixed mindset breaks instead of bends when confronted with change. Change is constant, some don’t adapt, others adapt enough to survive, a few use change to be successful. The less rigid and more adaptable you are, the fewer times you get stuck. Technology, resources, environment and tools change, it costs you time and effort to change but the cost of not changing will be higher. What was successful in the past, might not be successful in the future. By focusing on the past, you won’t be prepared for the future. The past has gone and can‘t be changed but the future is yet to be defined, embrace change and improve your situation. Robust code is decoupled, ensuring it can adapt to the evolution of requirements and manage the effects of change. Agile development leaves design decisions to as last as possible, giving more time to gather information and decide based on better understanding. Requirements and solutions evolve, the more detail you uncover, the more feedback you receive the greater your awareness of the problem and the solution. You can’t capture requirements up front and get a deep understanding without going through iterations of designs and problems. A project won’t change but you can change yourself and the approach to be successful. A project which does not adapt to the changes will fail. We are servants of projects, they will tell you when it‘s not working. Think about the pain points, how could this work differently. Nothing is fixed, people, requirements, technology and politics change, be fluid, formless and adaptable. Take a flexible approach, what was successful on previous projects might not be successful with these requirements, environments and people. When you think requirements are certain, you risk creating brittle designs and brittle plans that will break when change happens. It’s not if change happens but when and how you react. Projects evolve, the design at the start is not the functionality in production. This is because the requirements change with understanding and feedback. Each projects rhythm is unique and the most efficient way of working different. You have to adjust and keep improving, finding a smoother way to move functionality from requirements to production. Don’t fight change and don’t wait for it to happen, embrace change and use it as an opportunity for improvement. Change is not comfortable or easy and involves conflict but through this something better emerges. This week I am on the Dynamics 365 FastTrack Architect Bootcamp. The course is run by some of the Fast Track engineers who work on Microsoft biggest projects as part of the FastTrack scheme. FastTrack is offered to larger customer (250 seats plus) and the FastTrack team get involved to guide the customer and partner to make sure the project is successful. The FastTrack offers skype sessions, workshops and regular touch-points to make sure the customer is on track. If you are eligible for the FastTrack program then Microsoft will be involved in your project and help ensure the successful implementation of Dynamics 365 by using their FastTrack process and experience implementing Microsoft Dynamics 365. Microsoft’s FastTrack team isn’t one or two people but many different experts.